Dome and the Mojave Cross while we did this. The second thing on the list was the Rings Loop trail at Hole in the Wall and lastly we wanted to see the Lava Tubes. The first stop along the way was Teutonia Peak on the Cima Road. The trailhead for this hike is on the left just after you pass the Mojave Cross on your right (if you are driving north). The hike to Teutonia Peak is about 3.5 miles round trip with 700 feet of vertical gain. The first part of the hike leads through a very thick Joshua Tree Forest with a scattering of assorted cactuses throughout. The first mile or so of the hike in is relatively flat through coarse sand and gravel. We were lucky enough to have our first wildlife sighting of the day here. A Black Tail Jack Rabbit. The most striking feature of this rabbit is its huge ears. The large surface area of their ears allows for body heat to be lost through them during very hot days. Look at the ears on this thing! The climb up to the peak starts around 1 mile into but it is never too steep. As you start the climb up the peak turn back around and look at the land behind you. If you look close you will see the Cima Dome. It looks like you are looking through a “fish eye” lens. The Cima Dome is a smooth granite dome that rises 1500 feet above the desert floor. The hike up to the top through the rocks is beautiful. The rocks in this area remind a lot of the ones you will see in Joshua Tree National Park. The trail is well-marked but there are tons of cactuses as you climb, so watch your step! Once on the top you have views in all directions but because of the rock outcroppings there are plenty of opportunities for shade. Shade is a welcome thing in the hot sunny desert. We spent some time hiking around the top and taking in the different views before heading back to the car. There is a picnic table at the stop for the Mojave Cross so we decided to take a look at this after hiking to have a picnic lunch here. 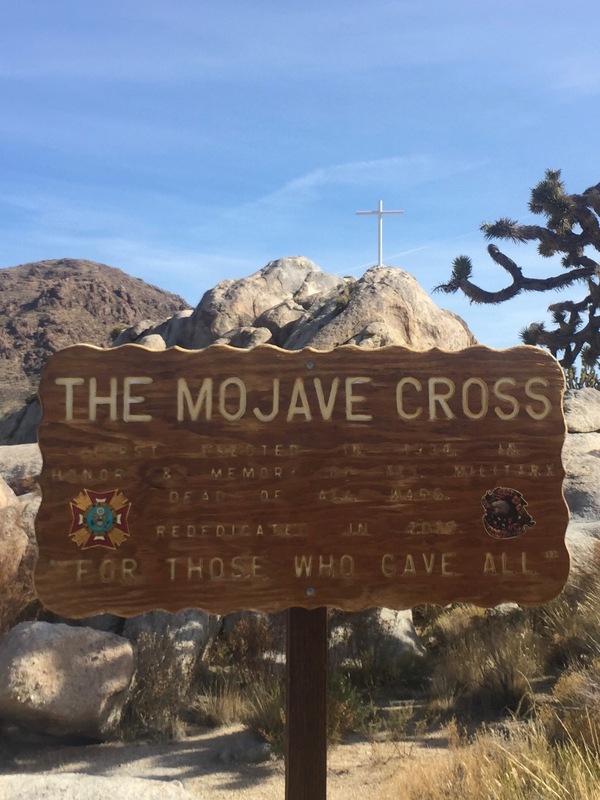 The Mojave Cross was originally erected in 1934 to honor the dead of all wars. We finished lunch and we were off to our next stop, the Rings Loop Trail. The trail is located near the Hole in the Wall campground reached by driving south on the Cima road to the Morning Star Mine Road and then turning left in 5 miles down the Cedar Canyon Road. The Cedar Canyon Road turns to a dirt road after a few miles. 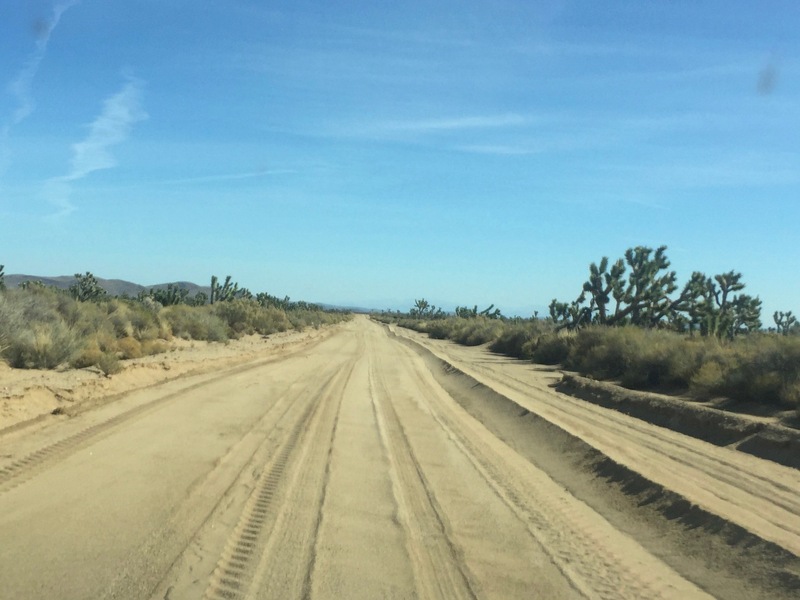 The road is in relatively good shape but there are some spots with soft “beach like” sand. We would have preferred driving in a Jeep but the AWD Honda CRV handled it pretty well. Unfortunately we missed the right hand turn to the Black Canyon Road and ended up driving several extra miles of dirt road. The only other vehicle we saw during this drive was a grader, so at least the drive back to the Black Canyon Road was newly graded. The Black Canyon Road was more hard packed than the Cedar Canyon road, so the last 10 miles on this road were not too bad. The Rings Loop trail is a short 1.5 mile loop, if you start by hiking from the visitors center parking lot you save the best part of the trail for the end. The first part of the trail is relatively flat as you hike around to the mouth of the canyon. There were plenty of free-range cattle watching us hike through this area. 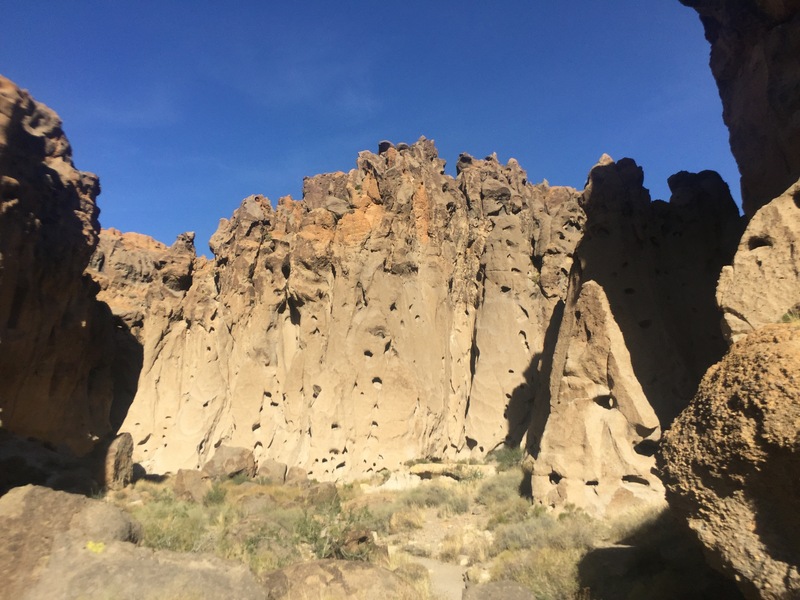 This area got the name “hole in the wall” from the many holes in the rocks that formed when a volcanic explosion deposited ash and gases. When the ash cooled, the gas left behind holes. See all the holes in the rocks? Once you enter Banshee Canyon this is where the fun begins. 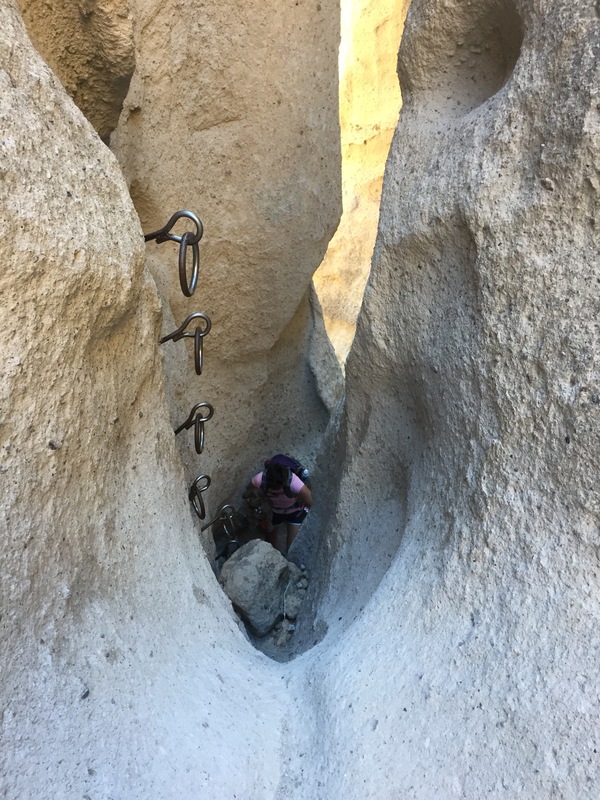 You need to scramble over boulders and pull yourself up through two areas that have rings mounted into the walls of the canyon. This area is very scenic and climbing out through the rings is a lot of fun. Gizmo was with us, but I would not recommend taking a dog on this hike unless they do not mind being suspended in air as you pull them up through the steep areas. Figuring out how Gizmo is going to get up through this one. Gizmo has no fear of heights and has no problem going up or down these steep sections. He was able to scramble up through most of these areas with his leash as the backup if he slipped. Of course he was wearing his Ruff Wear harness that allows us to pull him up through if need be. Some sections were a bit challenging even for us humans. If you want to eliminate the hike around to the canyon, you can park in the lot above the visitors center and descend into the canyon and then climb back out. This allows you to have “twice the fun” with very little distance hiked. Unfortunately we were not able to take in the Lave Tube since we did our “extra bit of driving” on the way in. We will have to save this one for a another day. 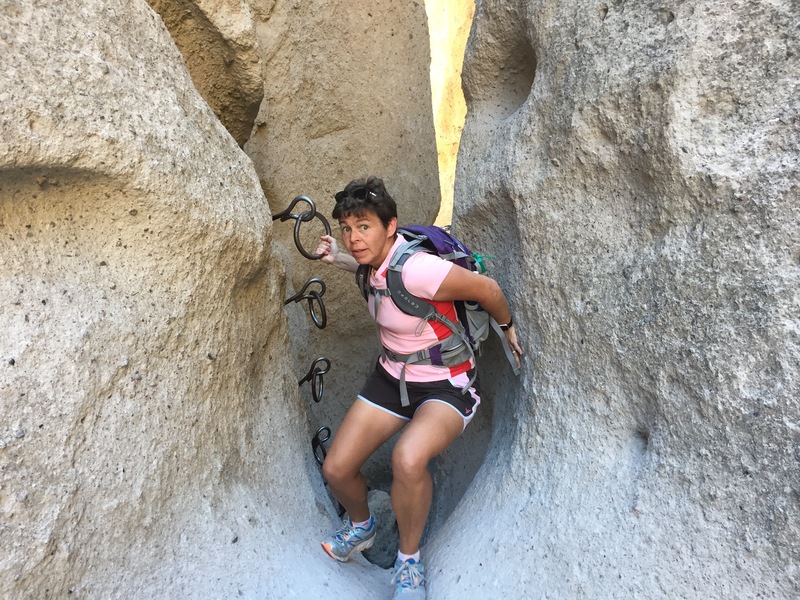 This entry was posted in Dog Friendly, Hikes, hiking, National Parks and Monuments, Sightseeing, The journey west and tagged Black Tail Jack Rabbit, Cima Dome, Hole in the Wall Campground, Joshua Tree, Rings Loop Trail, Teutonia Peak, The Mojave Cross. Bookmark the permalink.